The Proportional Valve Tester model PVT-439 provides a portable current source for testing proportional hydraulic valves found on earth moving equipment. 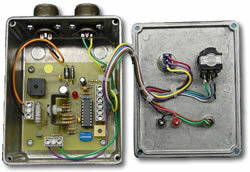 An input cable connects to the machine’s battery and provides 24 VDC input. An adjustable dial sets the current output. There is a calibrate position that provides a known current (typically set to 500mA). The current is fed out a 5 pin circular military connector to a cable with either alligator clips or a customer specified connector. 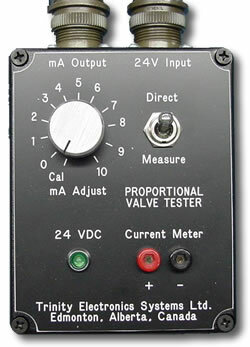 The current may be interrupted and fed to two terminals so that a current meter can be inserted into the current path for measurement.